NU - Doug DuBose 1 run (Livingston kick) 10:47. Rushing: Nebraska, DuBose. 13-117, Jeff Smith 20-96, Scott Porter 7-61, Turner 7-56. Kansas, Lynn Williams 8-14, Robert Mimbs 3-12. Passing: Nebraska, Turner 6-12-1-91, Sundberg 1-2-0-10. Kansas, Orth 6-9-0-119, Mike Norseth 14-25-0-103. Receiving: Nebraska, Hiemer 4-43, Robb Schnitzler 1-39. Kansas, Peete 5-81, Richard Estell 4-66, Mimbs 4-42, Jeff Long 3-30. Missed field goals: Kansas, Schwartzburg 47. Sophomore I-back Doug DuBose ran for 117 yards and two touchdowns while the Nebraska defense held Kansas to just 24 yards rushing to lead the Huskers to a 41-7 win over the Jayhawks. Quarterback Travis Turner capped scoring drives with 1- and 12-yard touchdown runs on Nebraska's first two possessions for a 14-0 lead, then the Huskers capitalized on a fumbled kickoff at the KU four to go up 21-0 less than 11 minutes into the game. 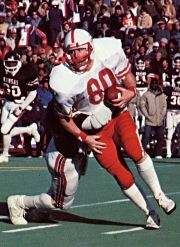 Nebraska also got 96 rushing yards from Jeff Smith in clinching at least a share of its fourth-straight Big Eight title.